In a few hours, a historic snowstorm is forecast to begin, blanketing Boston with 18 inches in many areas and 24 to 32 inches in some regions. Gov. Deval Patrick has urged the public to stay home, and directed non-essential state employees not to report to work. Many schools and offices have closed in response. The MBTA will close at 3:30 this afternoon and may remain shut down through the weekend. Have a Plan to Stay in Contact. Whether you live at home with your family or in an apartment on your own, have a plan to communicate with your relatives, landlord and others. Gather phone numbers for snow plow companies, neighbors and local police and fire departments. Check Your Community Website. Your city or town should post emergency information for residents to follow during the storm, including plans for clearing snow, snow storm accidents and emergency notifications. Keep in Touch Electronically. Charge your cell phone now and monitor news on TV and the Internet. Another source of information is to dial 2-1-1, the state’s telephone information call center during times of emergency. You can also sign up for electronic alerts from the state on your phone by clicking here. Social Media. If you are on Facebook, you can follow MEMA, the Massachusetts Emergency Management Agency by visiting its page. If you use Twitter, the hashtag for storm updates is #MAStorm. Gas Up. The lines at the pump may be long, but if you can, fill your car with gasoline. This will give you a way to charge your cell phone if your home loses power. Food and Supplies. Make sure you have enough food and supplies to pass the weekend, including bottled water and flashlights. Also make sure you have any medications you may need. Power Loss. We may lose power so set your appliances and gather supplies accordingly. Set your refrigerator to the coldest setting and have a cooler ready, so you can keep it shut as much as possible during the storm. Food can stay cold in a full refrigerator for up to 24 hours and in a full-packed freezer for 48 hours. Have non-perishable food on hand as well, such as granola bars. Turn Off TVs and Other Appliances. If we lose power, unplug sensitive electronic equipment such as TVs, microwave ovens and computers. These can cause irregularities when power is restored. Leave a light on so you know power is restored. Plan for a Heating Loss. Gather blankets and seal off unused rooms by stuffing towels in the space under the doors. At night, cover windows with extra blankets and sheets. Make sure you regularly eat. Freezing Pipes. If pipes freeze, remove insulation, turn on all faucets and pour hot water over the pipes. With caution, you can also use a hand-held hair dryer on the pipes. Clearing Snow. Keep up with clearing snow as much as you can in the early hours of the storm and after the storm, follow directions from state and local officials for clearing it from areas such as sidewalks. Clear Snow from Furnace Pipe. Throughout the storm, make sure your furnace exhaust vents remains clear of snow to avoid a build-up of carbon monoxide in your home. 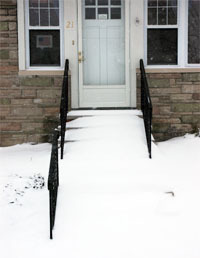 This is essential even when you cannot clear your driveway and other areas because it could result in poisoning. Winter Power Outage Safety Tips, Massachusetts Emergency Management Agency. The Boston personal injury lawyers at Breakstone, White & Gluck have over 85 years combined experience handling injury cases in Massachusetts, including those involving snow and ice accidents and premises liability. If you have been injured, it is important to learn your rights. For a free legal consultation, contact us today at 800-379-1244 or 617-723-7676 or use our contact form.